A senior at the University of Washington, Semhar Negassa is double majoring in Sociology and History. 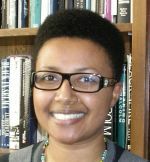 She was born in Addis Ababa, Ethiopia and has had the opportunity to live in a handful of countries across Eastern and Southern Africa. Her family immigrated to the United States in 2000. Since she is a first generation scholar, she hopes to join Teach for America upon graduating and later pursue a Masters in Social Work. She is, however, forever a student and enjoys expanding her academic and cultural experiences.